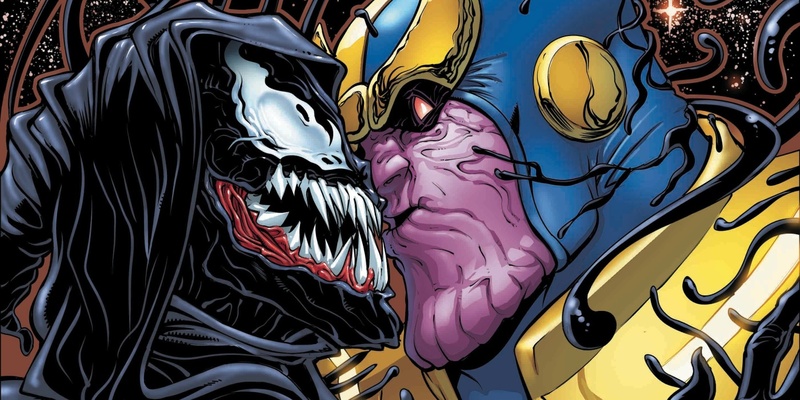 The Marvel Comics universe has been Venomized from top to bottom - and the supervillain Thanos mixed with his own symbiote isn't even the biggest threat. That's just how wild things have gotten in Marvel's Venomized event comic, granting every hero and villain a symbiote suit of their own, and turning a select group into murderous, mindless soldiers of the alien empire known as the Poisons. But before anyone assumes it's the actual Venom symbiotes who are causing the trouble, the heroes are still getting to enjoy the benefits of a living, sapient sidekick SKIN. Only when one of the Poison's spider-like parasites latches onto a symbiote does it become a servant of the alien hive mind, turning against its former friends and loved ones in the process. And in our exclusive preview of the Venomized #5 finale, a Venom-Thanos is literally dwarfed by his final endgame: taking control of towering kaiju. The infection of one of Kid Kaiju's towering creations has seemed inevitable since he was revealed to be the Poisons' ultimate goal on this version of Earth (having invaded, conquered, and assimilated countless parallel realities already). If a symbiote can be dangerous, and a Poison is downright malicious in its bloodlust... a skyscraper-sized insect is any Marvel superhero's word that nightmare. Unfortunately, our preview picks up right where Venomized #4 began, with the Poison's version of Thanos preparing to do battle with Venom, Spiderman, Cyclops and what's left of the uninfected heroes. Which is right about the time things go from bad to worse. The preview shows that Thanos was mainly a distraction, allowing the Poison Punisher to hit Kid Kaiju's insectoid Scragg with enough symbiote to convert it to the deadliest Poison yet. Marvel is keeping that battle under wraps for now, shifting the action to the heroes making their way back to the Poisons' base of operations. If superheroes battling evil, twisted, Venomized versions of themselves is your favorite subgenre of comics, then Issue #5 is going to be just what the doctor ordered. No matter how this event comes to a close, readers will have the visions of all their favorite heroes transformed into symbiotes to keep them warm. Venomized #5 will be available from Marvel Comics on May 2, 2018.